Hi there, I hope you've had a very lovely Christmas! Yesterday I had a brunch at my boyfriend's and in the evening we had a nice dinner at home with family. Both of those were very nice! The day before Christmas I went to Amsterdam for some shoppings. And at Urban Outfitters I found this beauty. 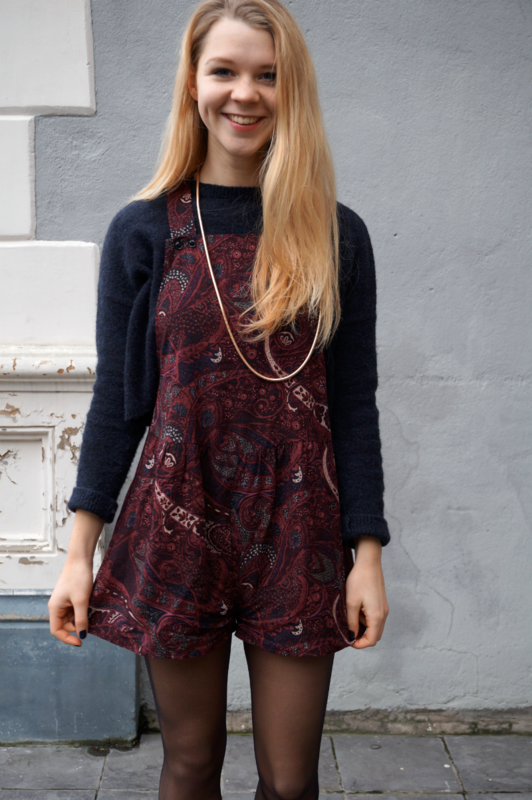 A sort of dungarees or jumpsuite with a lovely print. I bought it right away, I really like this one-piece because it is something different next to my other clothing. So today I made some outfit photos. I combined it with a golden necklace and my new crop jumper from Zara. This one is so soft and warm, and it fits my skater skirts and this piece very well. The coat is something lovely too. Bought that one at Primark for only 15 euros! And I have new chelsea boots, had those for a while already. They are from COS. Had to buy new ones because my Sacha chelsea boots were really wore out. So thats it about my outfit. A lot of new thingies, hihi. I love this one a lot because it is something new or different. What do you think of this outfit? And how was your Christmas? Echt een leuke en aparte outfit, ook mooie foto's! Love the outfit, it looks good on you! Die jumpsuit is echt ontiegelijk leuk! Staat ook heel leuk met die trui! Oh wauw, wat een mooie stijl heb je! Hele leuke jumpsuit :) Leuke blog heb je, ik volg je nu. Ooooooh nieuwe chelsea boots! Leuk leuk leuk! aaah heeel leuk! cos is mijn favoriete winkel, alleen helaas net iets te duur... Je hebt echt een leuke stijl! Wat heb jij een leuke smaak! De schoenen heb ik zelf ook en van de jumpsuit ben ik ook helemaal weg! Ohh ik vind deze outfit echt geweldig! Leuke outfit! Je jas is prachtig! !